Can Mindfulness Help Us Dismantle Inequality? The same mindfulness practices that transform problematic habits and thought patterns can help us tune in to the subtle ways that society cultivates barriers and “draws us to reinvest in segregation,” says mindful law expert Rhonda Magee. Mindfulness is often packaged as an individual pursuit: you carve out a space in a comfortable setting or a studio that suits your needs so you can take time to calm down, relax, or focus better for work. The benefits advertised are very me-oriented. 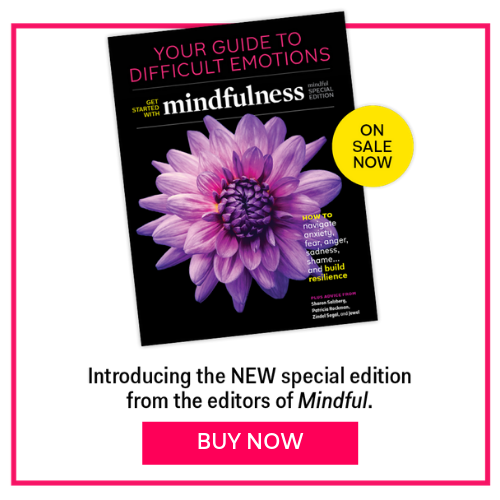 This personal project, essential to mindfulness, overlaps with an inherent tendency in society to stack or silo individual and community, says Rhonda Magee, mindfulness teacher and law professor at the University of San Francisco, in a recent podcast with Mindful’s Editor-in-Chief Barry Boyce. In other words, we see an opportunity for mindfulness to make us better team leaders, community members, and activists, but we don’t see where the personal and social agenda can align—indeed, would they cancel each other out altogether? “The problem is that in our society it’s sort of either or, it’s either about the personal or it’s about the social. And yet, if we can open to our own experience we know we’re always already both individuals and a world,” she explained. Magee’s research focuses on issues of social justice and inclusivity. In a world that faces increasingly complex problems, Magee argues that mindfulness provides an opportunity to understand issues through multiple points of view. Rhonda Magee: We largely continued to live in very segregated communities and cultures and systems. And that’s a fact that is one that we struggle to keep coming back to. You know, we know that part of the way we’ve been taught to look at these issues is that we were segregated officially, and now we’re not. And now if communities are racially identifiable or culturally distinct, it’s all a matter of choice. It’s all, you know, a matter of the market. It’s not, about patterns or conditioned habits and also structures, the way we do schooling, public and private, the way we continue to structure our religious communities. We tend not to really see how we are very, very, very deeply still embedded in and committed to, actually, we have a taste for, it seems like, segregation. Barry Boyce: We reinvest in boundaries that we think we’ve gone beyond, mentally, in our media, we reinvest in those boundaries. Rhonda Magee: We really do. Barry Boyce: …that you are more different from me than is really the case. Rhonda Magee: Yes, and we reinvest meaning, we send our kids to schools that are still very isolated. We move around the country. I live in San Francisco. I hear people find various and sundry different ways to explain why they leave a very diverse region. And often my white friends, for example, find themselves in much more white spaces after the “stresses of the city.” And, you know, sometimes this racial piece of it is mentioned, often not widely, but maybe in these quiet conversations. I had a young woman come and talk to me about a friend of hers; it’s often, you know, speaking about a friend, not myself. This young woman was an immigrant from Eastern Europe and she had another friend, an immigrant from Eastern Europe, who came to San Francisco and said she wanted to move away because she wanted to be around more Americans, and by that, she actually meant more whites. There still is a way that part of the legacy of white supremacy in America is that we define what it means to be American, still and in the eyes of many both domestically and internationally, as white. And that is what we are still up against, is what we have been seeing emerge in the political culture and the discourse around making America great again. So there’s a deeply embedded desire, or kind of a way in which we keep moving into segregation and reinforcing it, reinvesting in it, as you say. We’re all in that world. So, even mindfulness organizations are built up in networks that are already very segregated. All of our networks for reaching out, finding potential teachers, finding people to come to our organizations, our events, they’re already very segregated. And so, we are up against that challenge of, again, living in a society that’s already structured to push us apart. And those dynamics are coming from so many different institutions that it’s actually very hard for any institution to start reaching out to adults, adult learners or adult practitioners, and saying let’s come together from these very different places of relative segregation and isolation. And so a concrete way to address that is, I mean, there are short-term steps, but I actually think a longer-term cultural change is what has to happen. This effort must outlive our own lifetimes. It will. Another problem we deal with in the West is very short-term focus. If we can’t imagine our efforts realizing some gain tomorrow, or at the outside six months from now, we’re not sure it’s worth our time. We are not going to change these patterns in this country that took hundreds and hundreds and hundreds of years to embed without a commitment to changing them that is at least as farsighted. There still is a way that part of the legacy of white supremacy in America is that we define what it means to be American, still and in the eyes of many both domestically and internationally, as white. Rhonda Magee: It’s very easy to get frustrated. Barry Boyce: You think… this neighborhood isn’t going to change. Rhonda Magee: Yes, the community isn’t going to change, this meditation group isn’t going to change. Barry Boyce: Yeah. So yeah that’s very helpful. Keep going. Rhonda Magee: So, we need both a very long-term commitment and a lot of patience, both of which, I think, are gifts from me of my own mindfulness practice. And not that I’ve gotten there, right, I’m a work in progress just like everybody else. But to be able to sit with the frustration that comes with, oh, here we are again trying to address this same issue of the denial of white supremacy in our history with people who, once again, don’t want to talk about. It’s frustrating. Barry Boyce: How does patience square with the possibility of falling into apathy or not being willing to call somebody on something? Rhonda Magee: So it’s “both and” again. You know, realizing there’s time for, and a place in our own being in the world, for patience. And there are times for, and a place for, being in action. And it’s again, it’s not either or. It really is both. So there are ways we can call people into conversations about white supremacy with compassion for the fact that we all are in this together. We’ve all been trained away from this conversation. So, it’s going to be hard. It’s going to have to go by fits and starts and be interrupted, maybe even for years in a single organization because we’re not ready for it yet. To really deal with these issues is high pay-grade level mindfulness work. It isn’t for people who have not really come to see the depth of what it means to see clearly, what it means to work with our own conditionings, to sit in the fire of the painful recognition that, oh my mind actually does orient me to people who look like me. Oh, I do feel safer. Honestly, I wish I didn’t, but in fact I do feel safer when I’m in these places. Mindfulness can help us with a lot of the really subtle difficulties of doing the work that must be done to dismantle these patterns and habits that draw us to reinvest in segregation. Mindfulness compassion practices, these actually can help. Mindfulness can help us with a lot of the really subtle difficulties of doing the work that must be done to dismantle these patterns and habits that draw us to reinvest in segregation. So, it’s actually, it’s both that kind of patience that comes with a mindful holding of a multi-generational looking back and forward at the same time type of project. Because we are both, looking at our particular history, how we got here and trying to imagine a future for our children and our children’s children that will be much different. And then trying to work towards that future, in part by trying to redeem our past, looking at the role our particular communities, our particular families, our cultures have had in setting us on this journey that we’re on that keeps pushing us in corners and polarizing us. What’s been the role of our family, our culture, my neighborhood, my own conditioning in those tendencies? How can I address those and at the same time realize that we’re not going to address them overnight? We can’t. It will not happen overnight. We didn’t get here overnight. But we can take steps, we can take steps. This conversation is adapted from Episode Seven of the Point of View podcast with Barry Boyce.